We Have A New (Soccer?) Website! 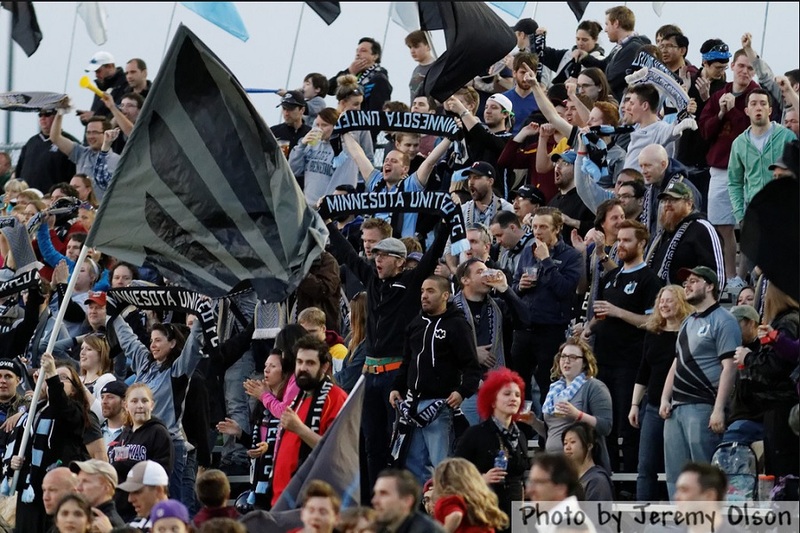 The second is that the local soccer team, Minnesota United, has possibly the most fun and creative fangroup the Twin Cities has ever seen. Just stroll through this gallery of pictures by photographer Jeremy Olson (who is providing many of the pictures for the site) and tell me you don't want to be a part of this. But the biggest reason is that we have a lot of brilliant soccer writers locally that should be heard. I’m not overstating this. Several have nationally recognized blogs that have drawn thousands of regular readers. They are passionate, obsessive, analytical and entertaining. Seriously, they’re so good they’re going to make you like soccer. Jon Marthaler, who many of you know either from The Sportive Podcast or his satirical work at TwinkieTown or his SoccerCentric blog on the StarTribune.com, recognized the irony of these three facts. He has been bothering us for a couple of years to do something about it. At some point, it became less work to just appease him. Or that’s that I tell him. The truth is that we do this because we love people who love stuff, and these guys love this stuff. I think there is a good chance that you’re going to love this stuff too, even if you’re determined not to. That’s a good thing. Finding stuff to love is life’s work. So please swing by and let us know what you think about the new NorthernPitch.com. I think you’ll see why we felt it was important to add this to the MinnCentric sites. And maybe you’ll even fall in love. So even soccer trumps the T-Wolves now? Basketball is my second sport behind baseball. Trust me, we're going to cover the Wolves soon. I mostly watch Premier League (3-4 matches a week, Go Red Devils!) and am hooked hard on World Cup. I mostly watch Premier League (3-4 matches a week) and am hooked hard on World Cup. The site should have a fair amount of EPL coverage. We're just getting our feet under us but expect a lot of non-Minnesota soccer coverage over at NP. And I had Wolves season tickets for years with a friend. They're coming soon, I promise. I've never followed soccer but surely pay a bit more attention now, cool idea! The Wolves site needs to happen even though the Cannis Hoopus, A Wolf Among Wolves and Dunking with the Wolves all do a really nice job. Would be interesting to see what you guys could do to further improve Timberwolves coverage. They're going to be very exciting to follow with Rubio, Wiggins and the rest of the young talent as well as KG sticking with the organization in some capacity long term. If you name it T-Wolves Press I'm taking full credit for the name!!! Ah, the growing empire! Congrats, guys! This is awesome!If you need someone to cover the German Bundesliga, I'll happily be that guy! By creating an account, you have access to the NP user blogs. We absolutely encourage you to write about the Bundesliga and we'd love to read about it. The more world coverage we have on the site, the better. We promote many of the blogs to the front page of the sites. PLEASE start writing about the Bundesliga. I would love that so much. When can we get a website about Minnesota Craft breweries? I'll hang up and take my answer off air, thanks. While I eagerly await T-Wolves coverage, the addition of soccer is a very good idea. I would visit that probably more than the Vikings and Wild sites. I'm not a soccer fan, but if the new site helps build more interest in and around Minnesota it could help show MLS that Minnesota is the best choice for them to expand to. Does this mean a NLL/Minnesota Swarm site could happen at some point? → Article: We Have A New (Soccer?) Website!